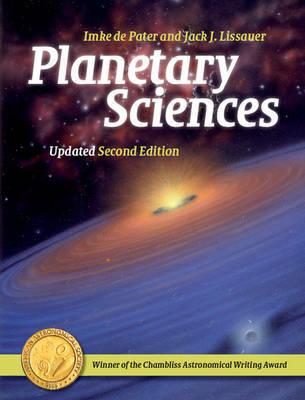 Buy Fundamental Planetary Science by Imke De Pater from Australia's Online Independent Bookstore, Boomerang Books. Jack J. Lissauer is a Space Scientist at NASA's Ames Research Center in Moffett Field, California, and a consulting professor at Stanford University. His primary research interests are the formation of planetary systems, detection of extrasolar planets, planetary dynamics and chaos, planetary ring systems and circumstellar/protoplanetary disks. He is lead discoverer of the six-planet Kepler-11 system, co-discoverer of the first four planets found to orbit about faint M dwarf stars, and co-discoverer of two broad tenuous dust rings and two small inner moons orbiting the planet Uranus. Imke de Pater is a Professor in the Astronomy Department and the Department of Earth and Planetary Science at the University of California, Berkeley, and is affiliated with the Delft Institute of Earth Observation and Space Systems at Delft University of Technology, The Netherlands. She began her career observing and modeling Jupiter's synchrotron radiation, followed by detailed investigations of the planet's thermal radio emission. In 1994 she led a worldwide campaign to observe the impact of comet D/Shoemaker-Levy 9 with Jupiter. Currently, she is exploiting adaptive optics techniques in the infrared range to obtain high angular resolution data of bodies in our Solar System.